From ‘The Haversack,’ The Land We Love V (September 1867), 422. And like Thomas Carter, we still remember Gettysburg, and many other battles like it, over 150 years later - because that terrible Civil War still has meaning today. I've had the privilege of visiting Chicago often over the years. It is a great city, with its amazing restaurants ... beautiful sights ... fascinating museums ... massive buildings .... and much more. It's pretty hard to beat a trip to Wrigley on a summer afternoon to see the Cubs, or a meal at Harry Caray's. I must admit, however, that January is not my favorite time to visit Chicago - but my most recent trip was an exception. Yes, the year was barely three weeks old. It was gray. The thermometer hovered in the twenties and thirties. Snow still lay on the ground, and another snow storm threatened while I was in the city. People walked the streets in fur-lined parkas. But the trip was still great, because I got to appear on Author's Voice. The Author's Voice is a streaming interview program that is produced and broadcast from the Windy City. The program has hosted many wonderful authors over the years, and it was my honor to be on the program for a second time. Here's a link to this year's program, in which we discuss The Lost Soldier. Enjoy! I was honored to be a guest in the latest episode (Episode 12) of Carl White’s Life in the Carolinas podcast. Carl White is an Emmy-nominated and award-winning author, syndicated columnist and TV show host based in North Carolina. His podcast, which shares some entertaining and fascinating stories about people and places from across the Carolinas, is available on iTunes, Google Play, Sticher, Spotify, and also the Life in the Carolinas website. I enjoyed my conversation with Carl, and the chance to talk more about my new book, The Lost Soldier. Here's a direct link to the website podcast. Enjoy! Over the last several days, American flags have waved at half-staff across our country. On December 7, it was in memory of the Japanese attack on Pearl Harbor, which took place seventy-seven years ago. American flags also stood at half-mast in memory of World War II veteran and President George H.W. Bush, who died on November 30. Which sparked memories. As a youngster, I lived two doors down from a Pearl Harbor survivor. That fateful Sunday morning, my neighbor stood watch on the USS Pennsylvania, and thus had a ringside seat for the attack. From his perch in the ship's crow’s nest, he could easily see enemy planes buzzing Battleship Row a short distance across the harbor. In the 1970s, with my neighbor's help, I completed my maiden historical project during elementary school: I wrote a paper about Pearl Harbor, and at my request my gentle neighbor came to our class to share his experiences. I've never forgotten it, or him. The passing of President Bush further reminded me how veterans of World War II once surrounded all of us. My elementary school principal fought on Iwo Jima. A fellow church member piloted a landing craft to the Normandy beaches on D-Day. Another flew bombers over occupied Europe. Yet another man I knew rode in a tank destroyer across Europe. I'm sure there were more such veterans and I just never knew it. Those men and women set examples of how to live and serve that I try to follow every day. A light rain started falling in in the early morning darkness of November 2, 1944. Like an amanuensis, a soupy mist settled on trees, buildings, and foxholes. The dampness made it feel colder than it actually was, though the temperature was already near freezing. “It was pretty miserable outside,” a German landser recalled. Gradually it grew light enough to see, but the sun stayed veiled behind clouds the color of dirty cotton. Soldiers stirred. Those selected to attack first rose first. Other companies, like Pete’s Company B and Company K, would not jump off until later so it was 7:30 a.m. before these men shimmied groggily out of their sleeping bags. After eating a hot breakfast, the soldiers packed their belongings. Col. Peterson woke early in his Germeter attic. One of his first tasks was to establish a sandbagged observation post for assistant division commander Davis. “I was to meet him at a specified point west of Germeter at a specified time on the morning of the attack to lead him to his CP,” Peterson later wrote. Dutifully, Peterson went to the appointed spot. When Davis did not appear, Peterson “deemed it necessary to get on with problems coincident with the attack.” It was the right call, but Davis later chewed Peterson out for missing their rendezvous. It was an inauspicious start to the operation. American guns shattered the morning stillness at 8:00 a.m. For the next hour, the massed artillery of the V and VII Corps fired four thousand preparatory rounds while the 28th Infantry Division loosed 7,313 of its own shells toward known and suspected enemy positions. Cota described it as a “fierce concentration of fire” that increased in volume, as the deafening artillery shifted to nearer targets at 8:45 a.m. From the woods west of Germeter the 112th’s heavy guns — from the 707th Tank Battalion’s Assault Gun Platoon, Company B, 630th Tank Destroyer Battalion, the 112th’s Antitank Company, and Company B, 86th Chemical Mortar Battalion — added their steel voices. Lt. Gunther Schmidt, a member of the 272nd Volksgrenadier Division, endured the bombardment from a vantage point near Schmidt. “There was a lot of confusion in the street, horses reared; we heard screams from the men that were hit,” he wrote. Authors of nonfiction books will tell you that the research never really ends. The first and second editions of my book Stuart's Tarheels were published in 1996 and 2011 respectively, but just last week I came across new information that I wish I had at my disposal then. This account does not entirely agree with research I unearthed for Stuart's Tarheels, but its description of a cavalry regiment on the march is fascinating. Indeed, the research never ends. I wonder what else is out there? My thanks to the staff of the Swem Library for their assistance. The Lost Soldier: Now Available Wherever Books are Sold! Today’s the day: my new book, The Lost Soldier, is now available wherever you buy books! 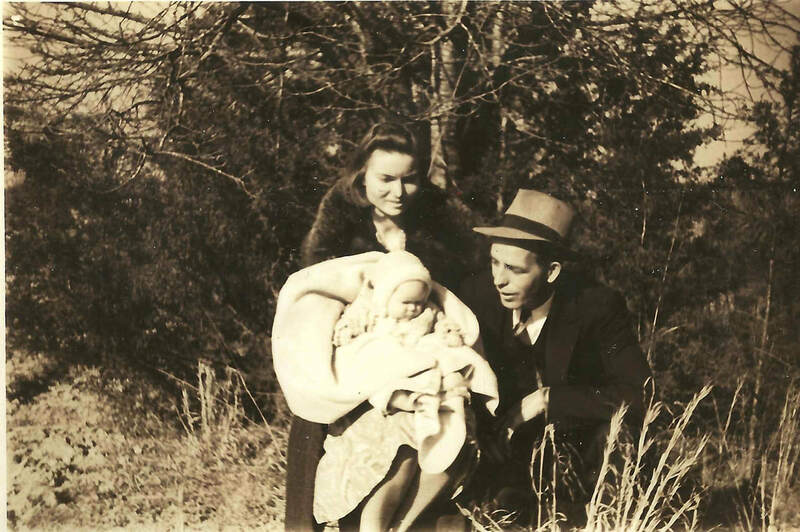 Follow Pete and Ruth Lynn (pictured here with their first daughter) on their World War II ordeal, from the home front to the Huertgen Forest. It’s a story you won’t forget. Check the upcoming tab for events where you can hear more about The Lost Soldier. (c) Chris J. Hartley. All Rights Reserved.